Today we have something rather special. The model under the microscope today is AGU Models Mitsubishi Lancer Evo IX. Never heard of them? Well, don’t worry. Neither have I...until now. AGU is a rather newcomer to the scaled model game. They’ve actually made a Liberty Walk 458 Italia based on GT Spirit’s alliteration awhile back. However, that was retooled to feature steerable wheels. The EVO IX represents the second model in their lineup. The model itself is completed in resin with a closed body design and are available in either red, Ralliart Red, black or Ralliart Black. It seems that as a protocol for new models on this website, examining the box itself is in call. Packaging is the same for most models at this price point, featuring a cardboard box with styrofoam inner clam-shell. However, it seemed that unlike the 458 LB they’ve made where the car was screwed in place, this was not. Instead, protective foam was used under and around the car. There was a rather unnecessary feature that came with the box...and that was the metal base that came on the styrofoam packaging. Most collectors would choose to display their models without a base.. so getting rid of that would hopefully cut the cost down? The exterior for the most part, is well represented. Paint is pretty clean, shutlines and panel gaps are tight like any resin models and carbon fiber details are visible on the mirrors, wing and front splitter. 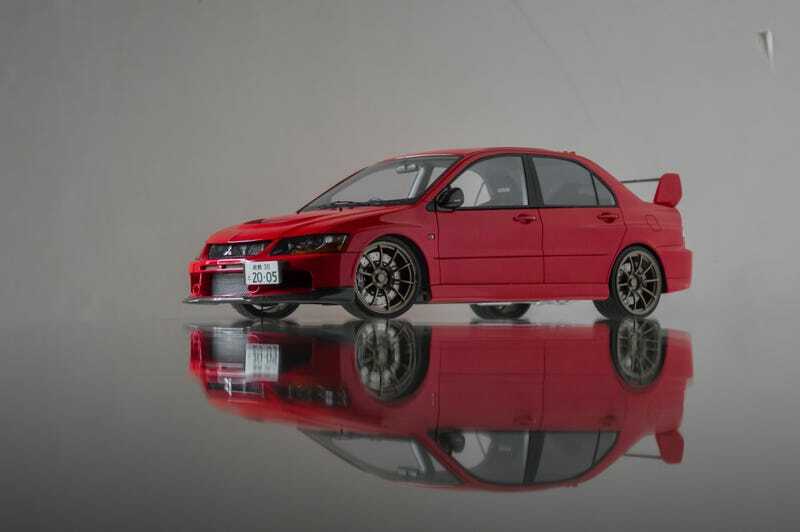 One thing I do have to note is that the car seems to be angled forward.. is that true on 1:1 Evo IX? Unfortunately, my model did get damaged either during the manufacturing process or shipping. For those with keen eyes, you’d notice the rear plate of the Ralliart only features half of one.. Now i’d like to put the blame on AGU’s manufacturing process considering I can’t seem to find the other half anywhere in the box. The wheels and tires on this car are well detailed. Instead of featuring stock rims, AGU chose to present the model in aftermarket rims courtesy of ADVAN. Both the brakes and calipers are well detailed, though a little more finesse would do it justice (such as prints on the tires). Now some would argue that the rims seems a tad small in scale. However, personally I feel like they fit the model. Those that owns a resin model would argue that capturing images of the interior could often prove to be quite a hassle..and that is the case with this as well. Quality wise, the interior is pretty well done. Aftermarket carbon fiber dash panels and center console are visible. In addition, AGU also included felted Recaro seats! On the flip side, the steering wheel leaves little to be desired. Generic and cheap looking for a model at this pricepoint. Here is where the model gets interesting. Besides the fact that this resin model features steerable wheels, it also features luminescent lights. A first for a scaled model if I recall correctly. The lights react the same way as any glow in the dark material will. According to the certificate that came with the model, the ‘auto luminaire’ will shine up to 30 seconds per interval. Unlike most GT Spirit or Otto, AGU chose the include perforated grills on this model. Definitely glad they did! Little details like the grills, carbon fiber works and Ralliart logos are what makes this car stand out from the hoard of resin models lately. Heck, even the hood intake’s perforated! Well done AGU! The front of the model is where the model excels over other resin brands. Every line, curve and angles are faithfully represented. No glue residues whatsoever are found on the model (cough GT Spirit cough) Again, perforated grills and luminescent lights are nice touches. The Japanese license plates are limited to the ‘stock’ models only, and not available on the Ralliart versions for those that are wondering. Similar to the front, the rear is well done as well. Metal decals and the 3D Mitsubishi logo adds to the realism of the car. Tail light execution is as realistic as you would expect from a top tier resin model. On the contrary, I would hope the rear diffuser would be represented in carbon fiber as well.. The underside of the model are simple. Not much is going on here besides a few engine and non-working suspension details. One thing that did peak my interest is that the model actually features a stainless steel pipe! Remember when I stated that AGU is a relatively new company? Well.. that is very obvious when we calculate in the quality control aspect. The company states that their products are build under the highest satisfaction. Ironically, that was not the case with my examples. Additionally, if you look up stock images of the car, you would notice that a antenna is present on the roof.. however, that wasn’t the case with my example as well. AGU Models Lancer IX succeeds on many level. It presents collectors with an alternative choice to those unwilling to pay the $400-$800 asking price on an AutoArt version. Yes the model is resin and yes the doors do not open like AutoArts version. But most collector would choose to display their models in a closed position. At the end of it all, I would still recommend this model to any JDM enthusiasts or for those on the market for a AutoArt Lancer EVO IX alternative. No matter what shortcomings the car features, it’ll still be quite a nice addition to any collection!